To Sum It Up: Trouble seems to follow twelve-year-old Percy Jackson wherever he goes. He’s on the verge of being expelled from his sixth school in six years, and he can’t even go on a field trip to the Metropolitan Museum of Art without causing a commotion. Percy is about to find out that all of these strange happenings are due to a heritage that he never would have believed possible, a heritage that is rooted in Greek mythology. The gods and monsters of legend become all too real for Percy, who is accused of stealing Zeus’s lightning bolt. Percy and his friends must embark on a dangerous quest to find the real culprit before war breaks out among the gods of Mount Olympus. 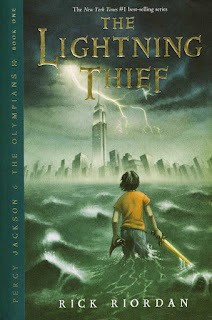 Review: The Lightning Thief is another one of those books that I wish had been around when I was a kid. I became interested in mythology at an early age. Growing up, we had this awesome edition of Webster’s Dictionary (yes, I just used the word “awesome” to describe a dictionary) that was a dictionary/encyclopedia hybrid. It featured a section devoted to mythology, and I happily whiled away my time learning about all of the Greek and Roman gods and goddesses. Reading The Lightning Thief brought back this warm and fuzzy memory of my first exposure to mythology and reminded me why these legends captured my imagination in the first place. Rick Riordan expertly brings classical Greek mythological figures to life in modern times. Even Mount Olympus receives a transplant through time, to the top of the Empire State Building. It’s very easy to accept that the Furies and Medusa are walking among us; our human eyes just aren’t able to see their true forms. I especially loved Riordan’s characterization of Ares, god of war, as a biker with a bad attitude. Dionysus, who in this version of things is the director of a camp for demigod kids like Percy, also made me laugh with his disgruntlement over his job and intentional bungling of Percy’s name. As I turned the pages, I eagerly awaited the appearance of the next god or goddess to see Riordan’s contemporary reimagining of him or her. Percy is the type of hero whom you want to see succeed. A lot of his school woes seemingly stem from having dyslexia and ADHD. His stepfather, whom Percy has nicknamed Smelly Gabe, treats neither Percy’s mother nor her son very nicely. Watching this kid who’s been written off by some people as a delinquent find out that his father is a Greek god is very gratifying. Percy’s problems with school are actually caused by his being a demigod; his brain is instinctively trained to read ancient Greek, and his heightened senses mean he sees much more than regular mortals do. Percy also possesses a pretty wicked sense of humor that spares no one, not even the gods. But it’s his bravery that truly defines Percy. Along with his devoted friends Annabeth and Grover, he journeys to the Underworld to rescue his mom and retrieve the missing lightning bolt. Naturally, this trip is filled with danger at every turn, resulting in a read that you can’t put down until you’re certain that Percy and company have safely escaped their latest scrape. Percy’s adventures are sure to thrill middle grade, young adult, and adult readers alike. The Lightning Thief is a perfect introduction to Greek mythology for younger readers and a nice refresher for returning fans like me. I look forward to finding out which gods, goddesses, and mythical creatures turn up in the sequel, The Sea of Monsters. All in All: I’ve been meaning to start this series for a very, very long time, and I’m happy that I finally had the opportunity to do so. A big thanks goes to Ally for 1) getting me to read The Lightning Thief at last and 2) finding her copy of the book that had been missing for months and lending it to me. I loved how seamlessly the Greek mythology was blended into the modern setting. I can't believe it took me this long to read it! I agree, Riordan did it so brilliantly which is why I was so disappointed with the movie adaptation. I loved how Smelly Gabe turned unto stone in the end. That was harass! Yeah, I've heard that the movie was a big letdown. I'll probably still check it out anyway, just out of curiosity. For some reason, I was kind of surprised about Smelly Gabe's fate, but man, did he deserve it! Thanks! I definitely plan on reading the rest of the books in the series.